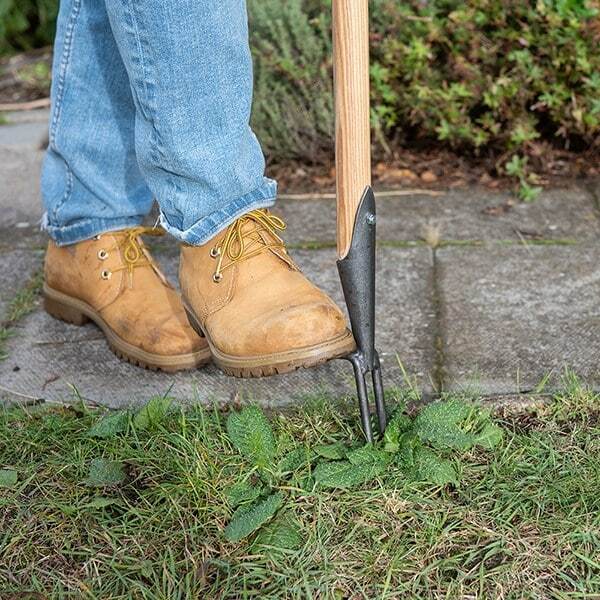 Buy De Wit weeding fork: <ul><strong><li>Removes weeds by their roots with minimal disruption</li><li>Robust forged carbon steel and solid ash</li><li>Lifetime guarantee</li></strong></ul><br>This streamlined two-pronged fork from De Wit is great for weeding lawns without damaging the sward, and ideal for tackling weeds in densely planted areas.<br> <br>The long narrow tines help you precisely target your efforts for super-efficient weed busting. 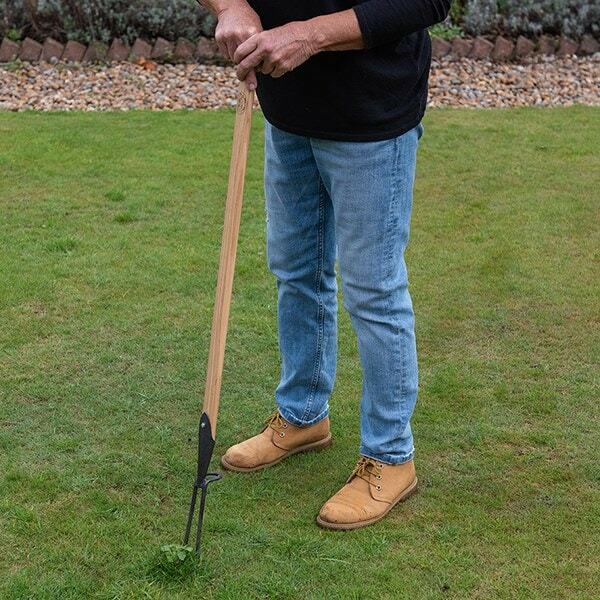 Just push the prongs into the soil or turf behind a weed, pull back on the handle and lever it out by the roots.<br><br> The sharp prongs are also useful for loosening compaction in heavy soil.<br><br>Like all De Wit tools, the fork is built for a lifetime of use. The tough carbon steel head is bolted to a long shock-resistant solid ash shaft, and finished with a chunky ergonomic T-handle to give you a secure, comfortable grip.<br><br>Measurements:<br>Width 4.5cm x height 6cm x total length 96cm<br><br>Please note: it is an offence to sell knives and other cutting tools to persons under the age of 18 years.<br><br><strong>About De Wit tools</strong><br><br>The Dutch are renowned for making the world’s finest garden tools, and De Wit is the most respected name of all. Founded in 1898, the family-owned toolmaker combines old-fashioned quality and craftsmanship with innovative design to create superior tools that last a lifetime.<br><br>Every tool is hand-forged in the Netherlands from tough boron steel - shaped, sharpened and burnished for durability, giving it the same blackened patina as traditional Edwardian tools. Each is fitted with an FSC-certified solid ash handle for ultimate strength and shock resistance, oiled to provide first-class protection against the elements.<br><br>All De Wit tools come with a lifetime guarantee against manufacturing defects, making them a truly once in a lifetime purchase. 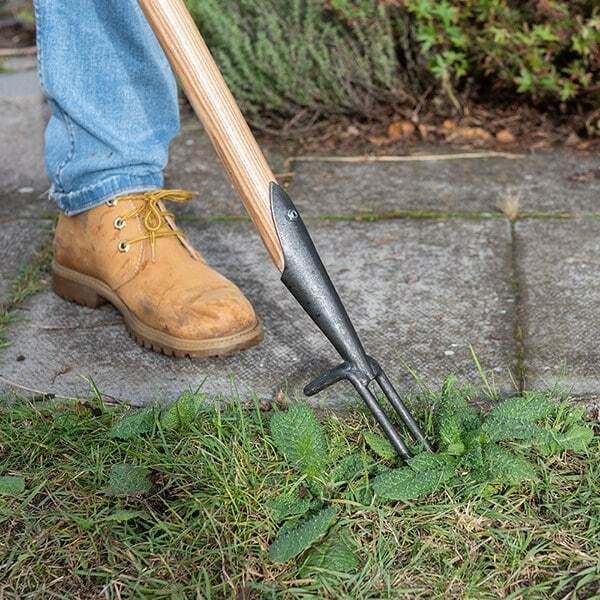 This streamlined two-pronged fork from De Wit is great for weeding lawns without damaging the sward, and ideal for tackling weeds in densely planted areas. 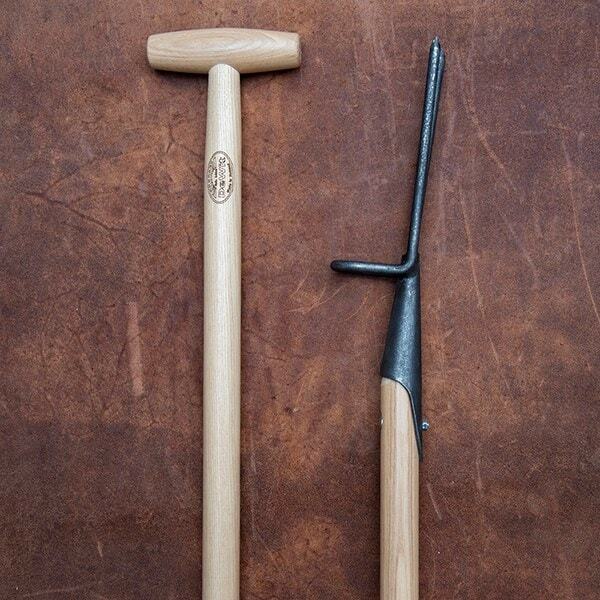 The long narrow tines help you precisely target your efforts for super-efficient weed busting. Just push the prongs into the soil or turf behind a weed, pull back on the handle and lever it out by the roots. 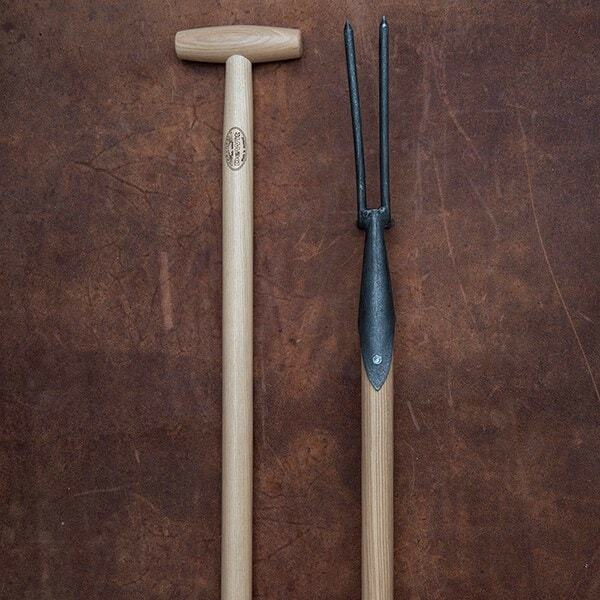 The sharp prongs are also useful for loosening compaction in heavy soil. Like all De Wit tools, the fork is built for a lifetime of use. The tough carbon steel head is bolted to a long shock-resistant solid ash shaft, and finished with a chunky ergonomic T-handle to give you a secure, comfortable grip.